We have had an exciting and productive week this week. The Christmas decorations have gone up and we are looking forward to all of the fun events coming up over the next couple of weeks. 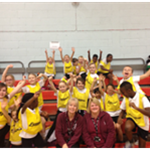 36 of our KS2 children had the opportunity to take part in an indoor athletics competition in Hornchurch this week. The children were a credit to the school and really threw themselves into the events. They even won a certificate for displaying the School Games value of ‘Honesty’. Thank you to Mrs. Davies and Mrs. Hood for taking the children and to all the parents who made the trip to Hornchurch to collect them. The children had a great time on their trip and learnt a lot about the Ancient Egyptians for their Builders topic. As we come to the end of Forest School for this term, Mrs. Buckley would like to thank Mrs. Viney, Mrs. Hick and Ms Pavlou for volunteering. We could not run Forest School without the help of parent volunteers, so please consider helping out in future of you can. If you have not yet returned your forms to request tickets, please do so as soon as possible. School lunches will need to be ordered for Thursday on Wednesday afternoon (due to the theatre visit). As we are having Christmas dinner on Friday, there will be no roast on Thursday, so the choice will be: Jacket potato with tuna mayonnaise, cheese and tomato pizza and for Key Stage 2, a tuna mayonnaise or hot chicken baguette. Please return the slip to say which Christmas dinner your child would like next Friday. Children may wear a Christmas jumper and/or a Christmas hat to get into the Festive spirit. This is just for fun, so you do not need to bring a donation. We are all getting very excited about our trip to the theatre next Thursday. Please note that the coach will be leaving school promptly at 9am, so please arrive by 8.45am so that we can take the register and leave on time. We will not be able to wait for latecomers. The children will not be having ice cream during the interval at the theatre, but we will be taking some chocolate treats with us for everyone. We do know which children have allergies and dietary requirements, but if you have a particular brand of chocolate or treat you would like them to have, please let us know as soon as possible. Reception class has been learning all about elephants this week. They had the chance to make some really colourful and tasty Elmer biscuits. Reception-69.29%; Class 1 and 2- 97.33%; Class 3 and 4- 97.93%; Class 5 and 6- 95%. Many of Reception class have had chicken pox this week, which has (unavoidably) affected the attendance. Rhiannon Geca, Demi-Bleu Strunkey, Oscar Knight, Sapphire Hagon and Daniel Davies. The Class 5 and 6 Work of the Week certificate was awarded to Scarlett Kedadi for her excellent RE work about the Christmas story; The Class 1 and 2 certificate was awarded to Fern Collins for her independent writing; The Class 3 and 4 certificates went to Chinaza Osaji-Okai for his apostrophe work and Bonny Blu Kedadi for her RE poster ; The Reception class Work of the Week was awarded to Freddy Parrish for his excellent sentence about what makes him unique. Well done to the following people who earned a place in this week’s Gold Book : William Smyth, Bradley Allen-Guinane, George Torres-Blanks, Conor Hazelwood, Finlay McKeown, Maddie Taylor, Dhiya Chagger, Chinaza Osaji-Okai. They have all displayed excellent learning behaviour. Congratulations to Krish Patel, Dylan Alexander and Elaina Goodison for earning their pen licences for consistently neat, cursive writing. The Headteacher’s award has been awarded to Finlay McKeown this week. Finlay has displayed an excellent attitude towards his work and has lived up to the school motto ‘The best that I can be’. A huge ‘Well done !’ to Sidonie Holmes for achieving a Merit in her Grade 2 cornet exam.